What’s up everyone? All right. So here we are, first day of July, finishing the morning up. $8,000, which is a great start to the month. Now, one of the things I’d love to do at the beginning of a new month is go back and look at the previous month and break it down. So that’s what we’re going to do today, we’re going to review. Of course, today’s trades, but we’re also going to review my metrics from the month of June. What you’re going to see is some big wins, some big losers. At the start of the month with a $16,000 loser. I spent the next two weeks digging myself out of the hole. But I finished the month up almost $37,000, which, overall, was really good. 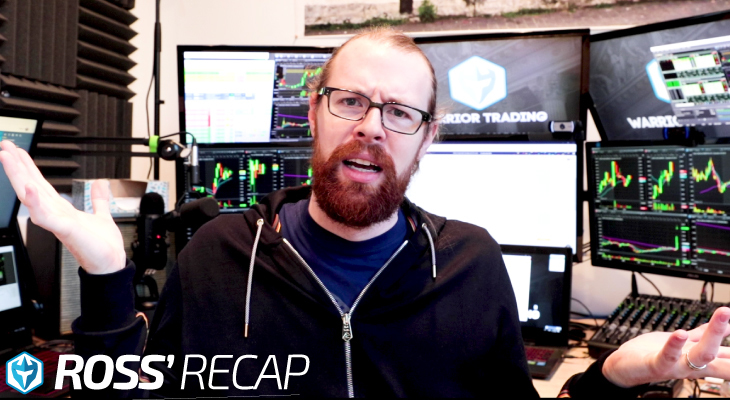 So, we’re going to break it down today during the midday recap, so you can get a sense of what I did last month and how some of the mistakes from last month are going to help me create new rules that I enforce this month, so July will hopefully be another $40,000-$50,000 month. That’s the goal. All right, we’re going to start breaking it down right now. If you have any questions, any comments, put them below. I’m going to come back through and answer them later. What’s up everyone? All right. We’re going to go over the trades from today, but one of the things I want to do is review all the metrics from the month of June. Now that June is in the books, I want to go through and kind of analyze what worked and what didn’t work. The goal of doing that is always to try to draw some conclusions that can make you a little bit better here at the beginning of the new month. So, new month, new you. If you made mistakes in June, if you were too aggressive, if you had big losses, whatever the case may be, this is an opportunity to kind of clear the slate. It’s a new month. So I’m going to do that even for myself. I made some mistakes. I had some days in June that I’m not super excited about. I look back on my month and I had some days where I … you know, I had to put the sticky note over the first day of the month because it was so bad. I didn’t want to look at it. So that was the first day of the month. Then I have a couple choice words here for other days that I wasn’t happy with. So, even me, doing this for years and years and years, I have opportunity to try to improve. Now, today is a great start to the month. I’m finishing the day up $8,006, which is awesome. I’m super happy about that. That’s a fantastic start to the month. My goal really is about $10,000 a week. That’s about $40,000 a month. That keeps me in good shape. So, to basically hit my weekly goal in one day is fantastic. That’s where I’m sitting here for the day, today, and we’ll go over today’s trades. But first, let’s take a step back and look at the month of June, what worked and what didn’t work. All right. So, what I use here is Tradervue. This is the website where I import all of my trades so I can go over the metrics and review everything. Now, I’m going to jump over here. Let’s see. 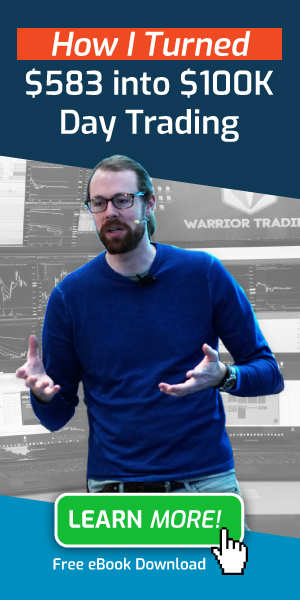 I’ll open a new browser, actually, to warriortrading.com/ … Actually, I’ll just go to warriortrading.com. 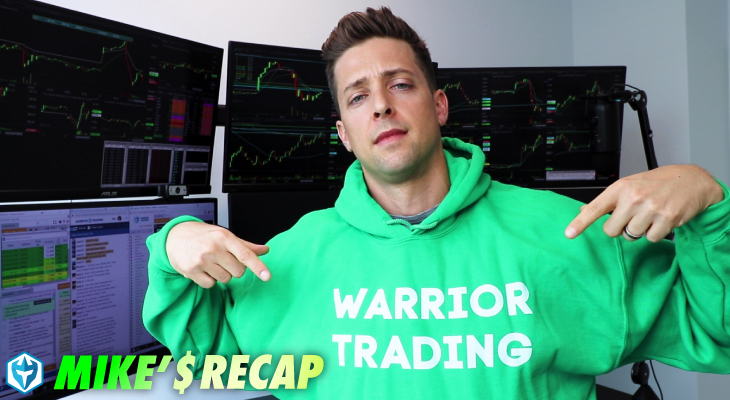 So if you guys go to warriortrading.com … Let me just close that one. All right. Scroll to the bottom of the page, which you’ll see are … my 2018 and my 2017 … are broker statements. I always keep the current year and the previous year broker statements right here. We’re going to look at 2018 earnings statements. 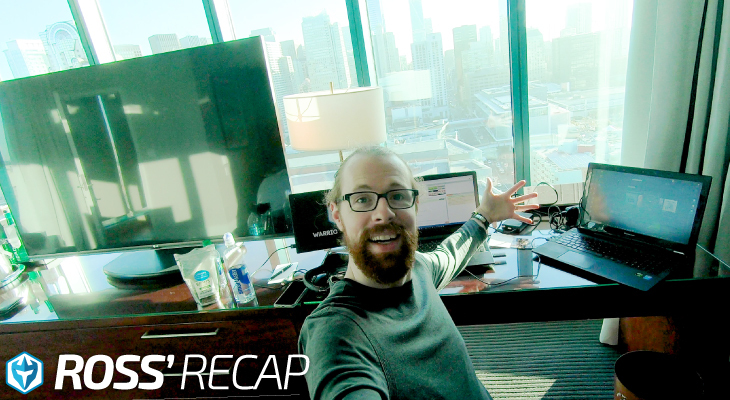 Now, one of the things that I do that most people don’t do in this industry, is I post my broker statements right here on the website every single month, because when I set out with this challenge to take $583 and turn into $1 million, I want it to be fully transparent and fully verified. I want you guys to know without a shadow of a doubt that this was real money. These were real trades. So every one of the broker statements has been posted. So, total gains as of June 30th, $648,000. I actually thought I was at 650, but I had some … My commissions ended up being a little higher on the month. So, $648,000. That’s still really good. From $583 to $648,000 in 18 months. All right. So, we’ll just scroll down here. This is 2018. So scroll down to June. All right, so June. This is my total profit, $36,784.42, total profit for the month of June. You can see here the Tradervue import and then my statement here. This is my traditional margin account with Lightspeed. Down here at the bottom, this is the P&L for each day. Then down here is the IRA account. So, in June, I moved my IRA from Interactive Brokers to Lightspeed. I had such a horrible time with Interactive Brokers. Their customer support was atrocious. The way the orders would fill were … It was horrible. And so, I moved my money. I moved the $21,000 in my IRA over to enter to Lightspeed, and I only took one trade in the month, and I made 400 bucks minus the Commission, $395.17. So, the IRA is growing, which is great. But it is growing slowly. All right, so we’ll back out of that or … Whoops. Go back. All right, so I just wanted to show you that. So now, right here on Tradervue, I’m going to look at the month of June, and we’re going to look at these metrics. All right, so June 1st, June 30th. Boom. This is my gross 43,000, and my net is $36,794. Usually, this is within $10 or $15 of actual … There are a couple of fees that are not going to show up here. Wire fees, certain Nasdaq fees don’t show up here, but it’s pretty darn close. Okay, so, big picture — $36,000. Okay, well, that’s a good month. Let’s look at the overview just for one second and look at the calendar. The calendar, you can see here for the month of June, I had four red days. All right, not bad. I kind of allocate one red day each week. So, four red days isn’t bad. Let’s scroll back up here, look at recent. This is how I started though. Isn’t that horrible? I mean, you can only laugh really because it’s just embarrassing. But okay, so, that was the first day of the month, big red day. Then I spent the next two weeks basically going sideways. I mean, I just was not making a lot of money. It was really frustrating. So just sideways, a small red day here, down 850 bucks. A green day, nice 7,000. Then I gave back a bunch of it on this day. Then this is where things really opened up. So this was the last two weeks of the month, and this is not totally uncommon. I think I have a small red day. Where is it? Yeah, that’s weird. Let’s go back to the calendar view. What was the second red day? The sixth? I think this red day was only $112. The blip is so small you can barely see it. But this is sort of the big picture. So, this is not totally uncommon for me to have really strong momentum at the beginning. It’s just one section of the month. Typically, what I’ve found is that my winners are often clustered together. So I’ll have really big winners and then I’ll have really big losers. I’ll turn my cam off so you guys can see the whole thing. If we look at the month of May, just for instance, 531, and just filter the month of May, you’ll see it’s similar. Really strong start and then a little slow in the second half. We look back at the month of April, you’re going to see a similar pattern. 430, really strong in the beginning, slow in the second half. All right. So it’s not uncommon for me to have a strong start and a weak finish or vice-versa. This month was a weak start and then a strong finish. What I found is that typically the winners are clustered together. The reason is when the market gets hot, we get this feeding frenzy where traders are just all jumping at the market. Everything that moves gets these exaggerated squeezes. So that, for me, that’s what I love seeing. You know, those big moves. So my winners are obviously … They’re all clustered together kind of right in here. This is when the market was hot. When the market is slow, you just really can’t make a lot of progress. It’s just slow and steady. So that’s just the high level of the month. Now, when we look at the detail $36,000 is good. Average winning trade, $908; average losing trade, $900. So that is a one-to-one. Let’s see. I can’t really make the dot. But one-to-one, profit/loss ratio. All right? One to one. Percentage of success was only 62% and that’s disappointing. That for me is pretty low. Biggest winner, 10,000 bucks, that’s great. Biggest Loser, also about $10,000. That’s not so good, right? You can see commissions were pretty high. I traded a lot. I churned a lot of commissions. If we go down and look at my performance by day, Fridays in the month were red, but that was mostly because I had that really, really big red day. So that doesn’t mean a whole lot. Profits, mostly in the mornings. As usual, no change there. Performance by price, I made the most money on stocks between $2 and $5. I lost money on stocks over 10 bucks. Not surprising, right? Just have that cut off. Over 10, don’t trade it. Now, today’s a day where, on GBR, you can see it’s up here at $11. It’s curling. It’s continuing higher. I’m up $7,625 on it, but I was taking my first trades down here at like 650. Actually, my first trade was at $6. That’s where I make the money on though. When they start to get up into this price range, I just typically don’t do as well. You might see a stock go from $12 to $24. But typically, when that happens, the spreads get bigger, the widths are bigger, the false breakouts are more dramatic, and that’s when you know you get in here. Then boom, you’re stopping out down here for a massive loss. 15 minutes later, it’s back at high of day, and you’re like, “Dang it. I’m the guy that’s losing on the stock that’s up so much.” So you got to know your sweet spot. For me, it’s under $10. All right. Performance by volume traded. Typically, I do better on … Oh well, this is my shares. For sure, when I trade more volume, more share size, I do better. Performance by in trade price range. So, I made the most money when the price range moved more than a dollar while I was in the trade. That’s not surprising, right? We know when a stock moves more than a dollar, that’s a big winner. So instrument, the biggest winners, the biggest losers. JAGX got me good. CLBS, CODX, DFBG, SLS, so these are my biggest losers. These are my biggest winners: ABIL, YECO … a couple China stocks in here … CLDC and XBIO. So XBIO, we can look at that chart. This one gave us some great opportunities. Over the course of a couple days, this stock went from a low of $2 all the way up to a high of nine bucks, and that’s in my sweet spot of price range, being under $10 the whole time. So, I did really well on that one. GBR made a little bit on that. YECO, ABIL, overall, they did all right. I made the majority of my profits, 23,000, on stocks that had between five and 9.9 million shares of volume. But for the most part, the profits for me, with anything above 500,000 shares of volume. Below that, not really much to speak of. I had this one loss. This was on, I guess, JAGX. That just is the luck of the draw. This one, when it’s over 25 million, I don’t do as well. So generally, I’d say my sweet spot is this area. This is sort of an anomaly because I took this loss and I held it too long. So we’ll talk about that in a second, and obviously, performance by relative volume. So, remember guys, those of you who are new, who are just getting into the classes, what were one of the things we talked about? We talk about the importance of high relative volume. So when a stock is trading on five times higher than average volume, that’s when I make the most money. $32,000, all right, so this is my sweet spot. Why would a stock trade on five times higher volume than average? That’s happening either as a result of some type of breaking news or simply a technical breakout. Look at GBR. These days are well over five times what is normal for the stock, right? XBIO is the same thing. This was trading on much higher volume. These are the places we want to trade. We don’t want to trade the low-volume stocks. Even a stock like JAGX, it got me really good on this day, which I guess was above volume, above average. But now, these days, don’t trade it. Not interested. I leave it alone. I just totally leave it alone. All right, so, that’s good to know. That just reaffirms what we talk about. Now, performance by instruments prior day relative volume. All right, well, this isn’t, I guess, that significant. This just shows it came out of nowhere, or all of a sudden, we’ve got big volume. Performance by instrument movement, stocks that move more than 2% is where I’ve got the bulk of my profits. Performance by opening gap made about two-thirds of my profits on stocks that were up more than 2%. So that’s what we like to see. I don’t think these are as significant for me. Yeah, I don’t think there’s as much here. So basically, what we can see here, and I’ll put my camera back up. What I can see from these metrics is that I had some really good days in the month, especially in the second half, but I had a couple of pretty bad days as well. One thing we can look at detailed, with the win-loss days. So, making $60,000 on my winning days and losing 23,000 on my losing days. This is disappointing to lose that much. So on my losing days, my average loss is 1,800 bucks, which is horrible. My average success rate was 46%. So I think, for me, one of the big decisions that I made in the month of June was to add the $5,000 max loss to my account. So if I’m down more than $5,000, I cannot take another trade. And so, I called my broker and I put the $5,000 max loss on my account, and that means, literally, if I’m down more than five grand, I can only close trades. I can’t initiate new positions, and that for me is a way to help me minimize having days that just get out of control. So that would have helped prevent that $16,000 red day. Now, I did have a $5,000 red day, like two weeks ago or whatever it was, right around two weeks ago. On that day, I hit my max loss, and I was done for the day, and I don’t think there’s anything differently that I would do on that particular day. I think that’s fine. That’s just part of the percentage of the time where I’m going to have losses and I’m going to lose money. I’m not that beaten up about that. I think that’s fine. The big thing really is having the max loss on my account, number one, and I guess number two, maintaining the presence of mind of what type of market we’re in. So even today, today is the beginning of the new month, I said to myself this morning, “Ross, you got to take it easy today because number one, it’s the first day of the new month. Basically, you’re zero on the month.” I have zero cushion. So I need to start by building a little bit of a profit cushion, number one. Number two, well, this week is the Fourth of July. It’s a holiday week, and holiday weeks are often … I think they can be a little bit sluggish. We don’t always see as much momentum because there’s just not as made traders in the market. So you combine that with the beginning of the new month. I got to take it slow. I don’t want to start with an 11,000, 15,000 loss the way I did last month. So that was kind of what I set out. That was my intention for the day. Now, I will look back. Let’s see. I saw one question there about my total stats for the year. So, $315,000 on the year. Accuracy, right around 65%. Profit/loss ratio, a little better than one to one. All right. So those are the high-level stats for the year. It’s still tracking for a $600,000 year. I have a goal of 665,000 for the year. If I have 665,000 profit, I’ll have made $1 million since January of last year. So $1 million in two years in the small account. All right. Let’s see. So, GBR. This one, right out of the gates, remember, every single day starts the same with reviewing our gap scanners. So here’s our gap scanner. We’ll run this historical timeframe on the scan for 9:19 this morning. 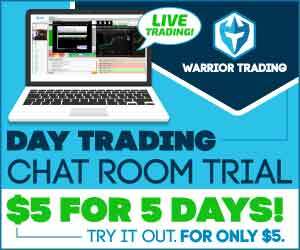 You can find stocks to trade in less than 10 minutes each day. So here we go. This morning, on the gap scanner, we are watching GBR. I think it was the nine … Let’s just do 9:10 AM. I don’t know why it’s not loading. So GBR right here, gaping up 46%, 2.04 million share float stock at $6. This has everything I like. Our SYS was a buyout, so no trades on that one. ADMP is a $0.05 tick stock, so no trades on that one. Remember the $0.05 tick pilot program, which is I believe set to end this fall. It makes it so certain handful of stocks in the market trade with these $0.05 increments. So, it’s 35 by 40. It’s very strange. It was sort of a test to see if it would spur investment in small caps and I think it hasn’t. So I’m pretty sure they’re ending it in the fall. But anyways, GBR was the one there that I was the most interested as the leading gapper that I would trade. Though these ones down here, I wasn’t super interested in. So really, this was the watch list today. It was GBR. Watching GBR for a long … Now, the thing is, I was a little bit unsure about it because number one, I didn’t see any actual headline. So I didn’t see any news to substantiate this crazy move from a $1.50 to 11 … that was now $11. But at the same time, if you try to apply logic and reason to the market, you’re going to go bankrupt, because the market can be irrational. It can be irrationally strong or it can be irrationally weak. And so, you just have to trade the technicals. And so, I said, All right. Here’s the technicals. The stock’s up 46%, with a two million share float. It’s the leading stock on my watch list today, and I think it’s going to be the stock that every trader is watching. So you have to think of trading … You know, this is, as day traders, we’re kind of like sharks in the market. We’re looking for opportunities. We can smell blood a while away, We’re looking for opportunities. Is there something moving in the market? If there is, we all come to it. All 100,000, 150,000, 200,000 day traders or however many there are, we all come for that same opportunity. So today, it was on GBR. Now, last week, it was on XBIO. That’s where we were all trading. I want to be looking for the one that we’re all trading. Now on the one hand, you might think, in that analogy, “Oh well maybe you have a better opportunity if you find something fresh,” which is true, but with the stock market, these stocks really only go up when other traders see them. If no one else sees them then nothing’s going to happen. They’re flat. So you need other traders to see them to get excited to also buy them for these big moves to take place. That’s how you get stocks that go from $2 to $8. When it comes to GBR, this is the one that was in play today, so this is where I expected to see a bit of a feeding frenzy, and because it’s a holiday week, I sort of thought that this might be the only stock that would be in play. We all kind of hone in on that one and that’s pretty much what happens. So I was watching it out of the gates. The bell rings and it dips below $6 giving me the opportunity to get maybe one of the best entries of the day at 591 and 599 and $6.00. But you can see two of the three orders were partial fills. The market was moving so fast they were partial fills. In the same second, I got in at $6 and sold at 615. This is 930 in eight seconds. Now, I want you guys to remember that even the best chatroom software in the world has latency. So by the time I’m saying that I’m in here, sometimes, this chatroom has as much as 10 seconds of latency. You have to remember that by the time I’m in here, I’ve sold here, you guys may not even know that I’ve even bought until 10 seconds later, and by that time I’m already out. So, this is why it’s so important for you guys to learn to trade these on your own. Some of these trades are so quick, you’re not even going to have an opportunity to get in even if you wanted to, because the opportunity is gone. So right here, from six to 615, boom. That’s 500 bucks. So I’m already at $500 in the first 10 seconds of the market, which is awesome. All right. So I sell more at 608. I end up adding at 620 and selling at 639. And so, what I’m doing now is I’m scalping the breakouts. Now, it’s starting to squeeze up, so I get in and I get out, I get in and I get out, and by doing that in the first minute of the day, I’ve made $1,000. The stock is squeezing up, as you can see, from 640 up to seven, all the way up to eight, and then all the way up to 860. Now hindsight, being 20/20, obviously, I should just bought here and max out my buying power and just held the whole thing at 850, but you never know. 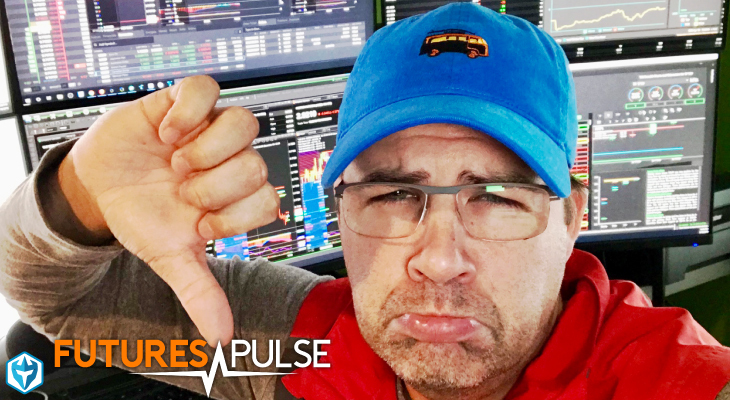 We’ve seen so many times, especially in the last couple weeks where we see stocks pop up on a gap and go and then come all the way back down and fill the gap back down to like $4, right? That could have happened. And so, for me, at the beginning of the month, I did what I said I was going to do. I’m going to take small winners. 500 here, 500 there. So now, I’ve got a 1,000. All right, so on the next trade, I get back in at … let’s see … 650, and I’m selling at 662. All right. So another little scalp. I’m getting back in at 680. I’m adding at 690. And now, I’m selling over $7. All right, making some good money on that one. Now, I’m up over 2,000 on the day. I’m adding back at 750. I’m selling at 770. Adding at 790, selling at 806. Now, here’s the thing. These entries, I made money on every single one of them. It’s because I have such strong conviction and I’m buying at places where I’m seeing dips and then surging back up. Dips and then surging back up. So, learning to spot those type of entries, it allows you just in a real time to capitalize on these opportunities with minimal risk. So you can get in and get out really quickly and you can book your profit with 90% accuracy. Now, you’re not going to be able to do that until you’ve practiced this strategy. And so, of course, that’s what the simulator’s for. Practice in a simulator. Prove you can be profitable and then switch to trading with real money, once you’ve proven you’ve got a track record of success. On this move here up to 860, I keep scalping. And again, like I said, there are other traders who have different approaches for how you want to trade these stocks. Some would take an approach of, “I’m just going to buy it and I’m going to hold the whole thing,” but here’s the thing. Those traders are going to have a lower percentage of success. Their accuracy is going to be lower because if you’re not selling at least half of your position up here at 7, and it comes all the way back down to six, well what are you doing? To me, you’re almost … I don’t know. To me, at that point, you’re starting to gamble with your account. Now, I trade for income. I take money out of this account to pay my bills. That’s when I started trading, I wasn’t speculating with a long-term account that I didn’t care about. I was trading to make $200 a day. I needed to capture that profit consistently so I could pay my bills. I don’t care about trying to make a million dollars on one trade. I got to be consistent. And so, for that reason I get in, and as soon as I get profit, I start to get out. Then I get back in. As soon as I get profit, I start to get back out. Obviously, there are times where I will swing for the fences a little bit more, when I have a little bit of a bigger cushion on the month, you know, when we’ve got a really strong market, things like that. But right now, on GBR, this is the third day of kind of crazy action, and I just wasn’t in a place where I felt comfortable swinging for the fences on the first day of the month. So just scalping the breakouts. So, getting back in here at eight, selling at 818, right? So that right there was 7,500 shares, is another 1,500 bucks, and I just kept doing it. Adding at 828, selling at 850. Adding back here up at 842, selling at 849, stopping out the rest at $8, and that was my first loss. I lost I think 300 bucks. Then we had BASI, the scanners. So BASI, this one was not on the watch list pre-market, but it hits the scanners. And so, as soon as it hits the scanners, I was like, “Okay. This looks interesting. It’s a stock that’s in my price range that I can afford.” Number one, that’s good. Number two, it’s moving quickly. It’s already up 17% on the day. Now, it’s up 20%, so it’s taking off, and this might be sympathy momentum. So what we often see is when one stock is really strong, when another one starts … So for example, you got the feeding frenzy, right? So you’ve got all the sharks that are all feeding and then someone, let’s just say, throws a metal object into the water. How many sharks are going to go and bite at it real quick? Because oh my God, that thing’s moving, and then they get their teeth knocked out, right? Well that’s kind of what happened on BASI. All of a sudden, something else starts to move, and I jump in it and so do all the other traders using these types of scanners, which are tens of thousands. These are available on Etrade. And so, I see it popping up and it squeezes up to a high of 230. So it squeezes all the way up here, and I’m like, “Okay, I’m going to get aggressive on this.” I take pretty big size. I’m adding at 18. I’m thinking it’s going to go into a circuit breaker halt and then it doesn’t. It hits 30 and starts to come back down and I’m like, “Uh-oh. I got to start easing up because now, I’m going to get into a jam on this.” And so, I start easing out of the position, but you can see this ended up being one of those false breakouts where it just goes up and then comes back down. It really didn’t hold up very well at all. It hit a high of 32 and then it retraced all the way down to 185. So that was sort of a false breakout. Now, I ended up making 600 bucks on it, and then it came back up and I took another stab at it. I took actually two or three more trades on it, scalping at a break over high of day right here at 232 and another break over 250. So until I made 1,100 bucks on this stock, but it really wasn’t that easy. It stopped out some at 98, switched back to GBR, got back in at 28 and 30. So this is just one that was not super easy. Now total trades today, 112. I was a very active trader today. But you have to be active, but when you got this type of market and that’s how you make $8,000 in one day. So BASI, a little of a false breakout, but then it rallies and it curls. So I ended up making a little bit on that. MXC, I jumped into this one and I got in it at 744, way up here, and it comes all the way back down. So, this is the thing, when you jump quickly, the next thing that moves, sometimes you’re right, and sometimes that’s how you end up getting in a stock at 744 and selling it at 850 and making a full $10,000. Sometimes you’re right and sometimes you’re wrong. So for me, looking back in my metrics, I’m right about … Well 65% of the time after commissions, before commissions come out, about 68% of the time. So you know what? I’m right enough at the time that I have the conviction to jump. Today’s a day where it just didn’t really work. We didn’t see that momentum carry on to any other stocks. It was really just on GBR, and I don’t know. It is what it is. I like seeing sympathy momentum because at a certain point, GBR, for me, just became too expensive. The risk was too high. And just to exemplify here, if we go into the 10-second chart, what you’ll see is that in this socket, there’s some sharp dips from 1150 right here down to 1083. Then 1150 back down to 1110. Those types of drops, when you’re trading with 2,500 shares, they can really hurt you pretty badly. 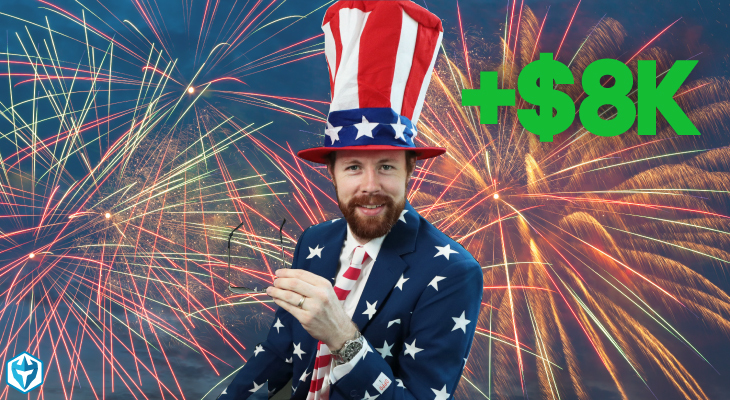 We’ve got $0.12 spread right now, $0.10 spread. So, the spreads start to get bigger. When you get these flushes, they’re more dramatic. That’s when you can make mistakes and you can have big losses. Then you can lose on this long or short. I mean, it’s not that either way is easy. These stocks, as they get volatile and they get more expensive, can be very difficult. So anyway, so those are my three trades today: GBR, $7,600 total profit; BASI, MXC. There are just so many trades on GBR. But what I was doing for the most part was just scalping. My final trade that I took on and the one that finally made me say, “All right. I’m done with this guy,” was getting in right here for the break over $10. So I got in. It pops up to a high of 1050. Then look at this drop, from 1050 all the way down to 850. That’s a two-point drop, right? So I was out up here at like 1020, and thank goodness because those types of drops can … I mean, that can kill your account. You could be the guy that loses money on the stock that’s up 183% today. I’m saying that because I’ve been that guy before. I know what it’s like. It’s so frustrating. That’s probably the strongest emotion that I feel as a trader from time to time is frustration because you’re trying to follow the rules, you’re trying to make good trades, and then you end up just getting caught in these big drops. So look at it right now. GBR is flirting with this $12 spot, right? But you have that resistance at 12 and then that little drop back down to 1164. This is kind of a curling price action, but these doji candles, the dojis is when you’ve got this sort of upper wick, that line there. You know, it tops out and pulls back. It tops out and pulls back. That’s when you start to see that choppiness. So, for me, it’s just I try to make money during the time of day when I’ve got the highest percentage of success, and you know what? Look, I was trading during these two candles right here. Look at that. Those are the two biggest green candles of the day. I’m not saying you couldn’t have stuck it out and maybe made some money here or maybe made some money here holding this, but this, to me, was … These were easy trades. It really was. It was getting in, getting out, capturing the profit. So the name of the game really is Learning to Identify the Right Entry Points. I love buying, anticipating half dollar and whole dollar breaks. My very first entry on this was just under six, going in for the break of six. Boom. Quick 500 bucks. I did it again once we were holding over six. I got back in at 608 thinking now, “If we break 610, it’s going to show me that it can hold over $6, and now, 620, 650 is the next level to look at.” So let’s see back in here at 620. Now thinking, “650 is realistic.” You know, adding, selling, adding, selling, I mean, it’s just getting back in for the break of the half dollar, selling at 60. Just keeps scalping these breaks. So here on this, you could have scalped the break of 12. To me, the wrist doesn’t match the reward at this point, on this stock, at this price range, and at this time of day. But these types of trades in the morning work really well. And look, you would have made money on this if you had taken that trade. But again, look at that. Just as quickly as it breaks 12, it can be back at 12 or below 12. And that’s why if you’re trading for profit, you’re going to train yourself to take the profit when you have it, to be selling some on the ask at 1233 because the next you know, this could be back at 1190. So there you go. You would have gotten filled on the ask at 1233 right there. All right, so you’re booking some profit, which is the smart thing to do. That’s what I usually like to do. I like to take all the profit. We can see some hidden sellers up here. There’s a lot of buyers but it’s not really moving up as quickly as you think. So 36, I’d probably be selling a little more on the ask at 36. 48, there you go. All right, that’s good. That’s typically what I’m doing. Now remember, this stock, in order for it to get halted on a circuit breaker, it’s going to have to go up 10%, which is $1.20 in one candle, basically, in two minutes. To me, I just don’t see that. I don’t see that really happening. I mean, it might happen, but it’s going to have to really, really take off, and I’m happy with the profit I’ve got on it. $7,600 is a great day. I see that question on YouTube or on Facebook. “Do you think you’ll be able to make a six-figure day just scalping and not holding through the big push for something like GBR?” So I think for me to have a six-figure day, what I need is to have a stock like this that I get into really early on, and on my very first trade, I get a really big winner. So I’m in with like, let’s say, 10,000 shares. It squeezes up and it hits a circuit breaker halt at 750. So I’m already up 15,000. Then it ends up opening, like a point higher and squeezing again and going into a second halt. The stocks that I usually make the most money on are when they move four to five points over the course of a few minutes. So that’s kind of what I would expect. That’s what I would need to have happened in order to have a $100,000 day. These types of stocks, I could continue to scalp them, but the problem is I have to start reducing my share size to accommodate the higher level of risk. Then when I do that, I’m not going to make as much money. So then it’s kind of not worth it. You know, here again, like obviously, could’ve gotten in at 12 and sold some at 1233, but look at that. Now, it’s back at 1233. So if you’re the guy who said, “Oh man. I sold at 1233, and now, it’s at 1280. What was I thinking?” Well here you go. it’s back at 1233 and that’s how quick it could come right back down. So that’s why you have to train yourself to take the profit when you have it. That’s how you make it real, and that’s why I take money out of my account every a couple weeks or every month. I make that profit real. I don’t want to just leave it all here, so one day, I end up doing something impulsive and losing months of hard work. It’s all about consistency. If we go back here, January 1st, 2017, this is when I began my small account challenge. So let’s see. Which one is it? I always forget. Win/loss expectation, I think. So this is where I’m at right now. I’m just going to blow this up. This is the big graph. Let’s see. I’ll put this up in the top corner. Oops. Sorry. All right. So that’s where I’m at right now. I try to be the guy that doesn’t have any big dips. Now obviously, I had a long period here last summer that was pretty slow. This wasn’t a lot of fun. But then, it opened up. November, look, December, January. In those three months, I made $240,000. Things were a little sideways for me in February. I lost $10,000 total. Then back up, lost a little bit of money here and I don’t know. This is one day, a couple red days at the end of May, and then they opened back up. So, this is my path to a million dollars, from $583 to a million bucks without blowing up my account, without having a big haircut, where I just have that big drawdown. So does it mean that I’m a little more conservative and sometimes I’ll miss some of these moves? Yeah, sure, it does. But this is the type of trader that I want to be — slow and steady. For me, that’s the name of the game. All right. Let’s zoom this back out. So that puts things into perspective. And again, you might be a type of trader that’s willing to take more risk, and you’re willing to buy it at six with 10,000 shares, and you’re okay with holding it, and you’re still holding it, and you’re up 60,000 bucks. Good for you for being able to do that. But I can’t do that. I can’t do that because I can’t afford to have that amount of profit and not lock it up. What if, God forbid, this got halted on a T12? Right? What if it’s halted for six months and it resumes at $4? I’m not saying it’s going to happen, but what if that happened? I was just holding this huge profit, I didn’t lock it in, I’d be so upset. That’s just the way I come to the market. It’s every day looking for a consistent profit. I think that’s what most of you guys are doing, too, for the most part. I don’t think most of you are in the position where you’re going to be swinging for the fences and trying to go for some huge, huge home run. All right. So anyways, I just want to break this down for you guys and give you a sense of where we’re at here coming to, you know, from the end of June and coming into the beginning of the month. I’m looking forward to the month of July. We’re off to a great start with $1,000 profit, and I just want to keep it going. All right, so that’s the game plan, and we’ll be back at it first thing tomorrow morning right around 9:00-9:15 for a pre-market analysis. Anyone watching on YouTube, watching on Facebook, if you have questions, leave them below. I’ll come back through and I’ll answer them later on today. All right, thanks everyone. I’ll see you back here first thing tomorrow morning.